F850GSA and F750GS versions in production. Standard F850GS version shipping now. Remember—protection of your bike is not only about the design of the skid plate and the coverage it provides. The mounts play a key role in how your skid plate will survive and how your bike is ultimately protected. We've seen far too many engine cases break due to poor designs of the underlying mounts. Once again BMW has developed a motorcycle with absolutely no convenient mounting locations for a durable skid plate. There is no cradle or framework to tie into for mounting a rugged skid plate—so we had to get creative. BDCW’s continues its innovative approach by creating a one-piece underlying mounting bracket that ties into the center stand's framework. Our design effectively prevents the skid plate from shifting backwards and potentially damaging your bike. This design, combined with a rubber Shok-Blok installed between the front of the skid plate mount and the engine case, ensures our skid plate and mounting system will take a beating long after others have failed. Ease of installation was another critical design element, as was removal of the skid plate for maintenance. The initial installation of your skid plate should take less than 10 minutes. And with only four bolts to remove for maintenance duties, the skid plate comes off in less than 60 seconds. Made from 3/16-inch (4.76mm) 5052 aluminum, the BDCW ULTIMATE Skid Plate provides maximum protection of the engine components and header while providing a smooth glide surface to clear obstacles with no exposed bolts or plastic sliders to get in the way. Our design is also useful when performing maintenance on the bike as it provides a flat level surface to lift your bike. If you have a LOW model - please contact us for details. ENGINE BARS—we have provided plenty of clearance to the engine crash bar mounts and don't anticipate compatibility issues. We've tested the skid plate with the Hepco-Becker Engine Bars which works flawlessly. We're impressed with the design of the Hepco-Becker Engine & Tank Guards and have no doubt they'll prove to be extremely stout (which is why we mounted them on our shop F850GS). See Related Products. AFTERMARKET HEADER SYSTEMS—not yet tested. Our ULTIMATE Skid Plate provides maximum protection of vital components such as the oil cooler, oil filter, engine case and exhaust headers—MORE protection than any others on the market. We offer the absolute MOST protection for the header system, which is $1,600+ to replace. 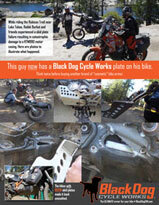 Our skid plate is VERY inexpensive insurance. Our design keeps the skid plate snug to the bike while still providing enough of a "crush zone" to protect the components on the bike. Extremely stout mounting bracket that ties into the center stand frame at the rear, preventing the skid plate from shifting backwards from a big hit which could potentially damage your bike. You get what you pay for. And we found the optimal material to protect, perform, and last. In fact, it may very well outlive your bike. The grade of aluminum we selected is designed to ABSORB impacts, not transfer the force to the mounting points on your bike. No holes to snag on rocks or branches. Our plate glides on its own—right up over most obstacles without bolts, plastic glides or rivets to catch or break off. We will be offering a separate component to protect the exhaust resonator and to extend the glide surface of our skid plate to clear obstacles. See related products for details. Our skid plate can be removed for maintenance with only 4 bolts—the mounting components stay in place once installed. Less than 60 seconds to remove or re-install. No bones about it, we manufacture all of our Black Dog products right here in the U.S. It is extremely important to us. We have world-class manufacturers in our own backyard and we use them. We personally test all of our products on our personal motorcycles. Additionally we have customers worldwide that are putting our products to the test every day.